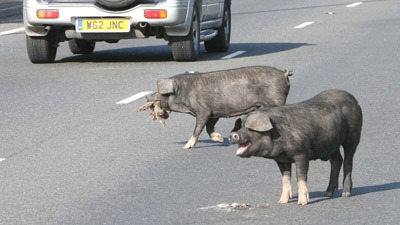 A busy motorway had to be closed after a herd of pigs escaped and ran on to the carriageway. The M11 was closed as pigs escaped from a crashed truck and had to be rounded up, reports Sky News. The southbound M11 towards London was shut after a lorry carrying a consignment of 82 pigs crashed. via Ananova – Road hogs close M11. A Web designer says she was struck by the decor at a New York City restaurant — when it fell on her head. Raina Kumra says in a negligence lawsuit filed last week that a 150-pound stuffed moose head with 3-foot-wide antlers plummeted off a wall at the Scandinavian-themed White Slab Palace on Oct. 4 and hit her. She says she suffered a concussion and other injuries. via Suit: NYC Eatery Patron Hurt by Falling Moose Head – ABC News.